Sensitivity is usually an early symptom of decay, gum recession, over-zealous brushing or hard clenching or grinding habit. Before blindly following what in the television advertisers say, it is mandatory to check the underlying cause and take treatment . Sensitivity to hot or cold food and beverages, acidic food like sport drinks, orange juice, tomatoes, fruit and yogurt can cause painful sensitivity in your teeth. Contact with cold air is another of cause sensitivity. Tooth colored fillings can be used to treat the decay. This will prevent further damage of teeth and free you from sensitivity with esthetic results. 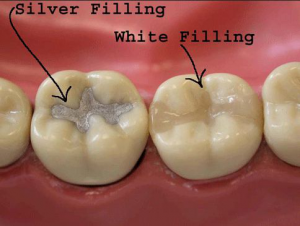 Fillings done with tooth coloured high strength filling material which releases fluoride. Indicated for posterior teeth. Designed primarily as a restorative material for use in Class III, V and deciduous teeth, GC Fuji II LC Improved is a multipurpose material, with secondary indications such as liner, base and core build-up. It has excellent aesthetics as particle size is small. Filling done with most aesthetic and natural colour looking material for posterior (back) teeth. 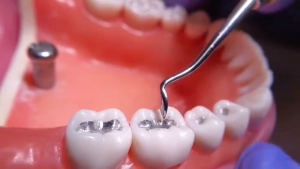 Amalgam fillings are very rarely used nowadays because of mercury toxicity and low esthetic looks. Intermediate restorations intended to remain in place for up to one year as well as during multiple sitting RCT. The material has sedative like qualities on hypersensitive tooth pulp and is a good thermal insulator as well. Unattended dental decay can progress to infection of pulp, root apex and can even spread to the adjacent bone and soft tissue leading to swelling. This can be treated by placing an incision on the soft tissue swelling and draining pus which is done by Specialists once infection subsides further treatment is advocated. Old age, poor oral hygiene, medical conditions such as diabetes, injury’s , smoking , poor-fitting partial dentures, teeth not in right alignment, teeth grinding while sleeping. Technological advancement like LASER Desensitization, Dental Microscope assisted root coverage procedures can cure sensitivity can save the teeth. Mild cases can be treated using scaling and root planning ,dental varnishes can be used to seal the exposed dentine, serious cases will require gum grafting. Headache, earache and even jaw pain. Anxiety, sleep disorders, missing or abnormally positioned teeth. They can be constructed of hard acrylic or soft materials and fit over your upper or lower teeth. Reshaping dental surfaces or by using crowns. This indicate gum disease, which will soon lead to tooth loss. It may be due to poor oral hygiene, ageing, diabetes, pregnancy or genetics. Gum disease is usually due to plaque and calculus accumulation around the teeth. If addressed early, your tooth can be saved. Delay in treatment will result in loss of teeth. Even when we brush/ floss regularly, plaque build up occurs in a few nooks and corners that are not reachable to the cleaning aids. This plaque collection hoards bacteria that is the very cause of decay and gum disease. Studies show that this bacteria also spreads to the heart, reproductive organs etc. In diabetics, it may even cause tooth loss. It is advisable to go for an ultrasonic tooth cleaning once in six months. Gum infection almost always progresses to the bones, which being delicate, almost always dissolves resulting in a loss of tooth support – this is the reason for shaky tooth and migration of the teeth causing spaces in between the teeth. When the gum disease has progressed to this level, it may also have puss build up in the gums and pockets causing bad breath. In such a situation, it may be necessary to augment the bone support that is lost by adding calcium particles to the tooth surroundings. This will strengthen the tooth further and prolong the life of the natural tooth. When bone loss cannot be just compensated with calcium particles, we use special bone growth inducing growth factors to enhance and ensure healing. These special proteins are sometimes derived from the individuals own body (platelets) . 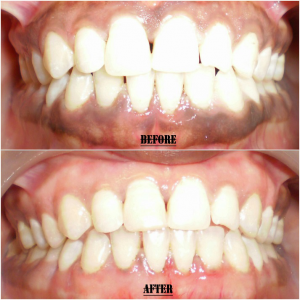 Removal of the black pigmentation of the gums to make the gums pink is called gingival depigmentation. When the bone around the tooth is lost, the gum sags and gradually recedes exposing the roots of the teeth. This causes sensitivity . This cannot be cured by desensitizing tooth pastes, it has to be “covered” by stretching the gums and placing them back in their original position. This is a procedure to stabilize shaky teeth till the bone healing occurs. When periodontal disease is detected, first recommendation are a few behavioral changes including an enhanced oral hygiene program, quitting smoking, and possibly some additional lifestyle changes. All the above mentioned procedures can be performed using LASERS. The advantages being, less bleeding, faster healing, pain free. 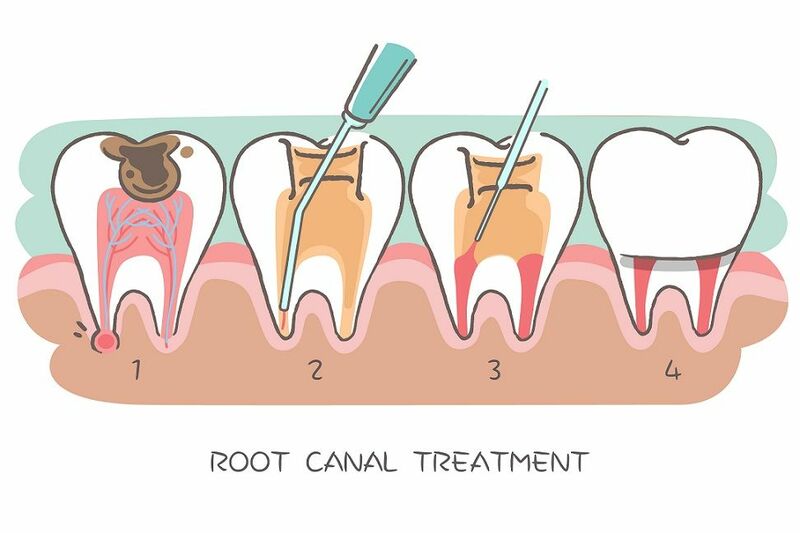 The procedure includes cleaning and smoothening the root surface of the tooth to prevent further accumulation of plaque on the root surface – that can cause more bone support loss for the tooth. When the bone around the tooth is lost, the gum sags and gradually recedes exposing the roots of the teeth. This causes sensitivity . This cannot be cured by desensitising tooth pastes, it has to be “covered” by stretching the gums and placing them back in their original position. 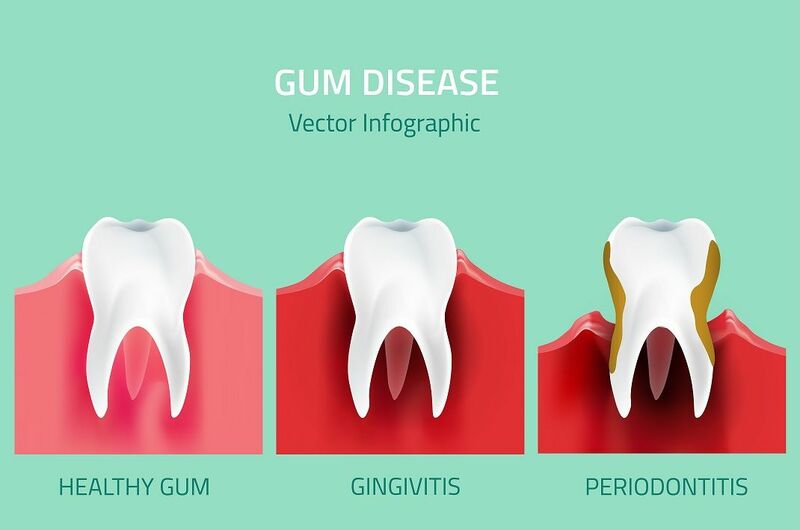 Gum infection almost always progresses to the bones, which being delicate, almost always dissolves resulting in a loss of tooth support – this is the reason for shaky tooth and migration of the teeth causing spaces in between the teeth. When the gum disease has progressed to this level, it may also have pus build up in the gums and pockets causing bad breath. 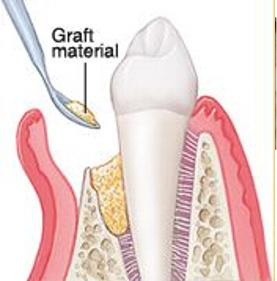 In such a situation, it may be necessary to augment the bone support that is lost by using graft from patient’s own body. Medications that are applied over the gums following gum surgery to promote healing and prevent infection. 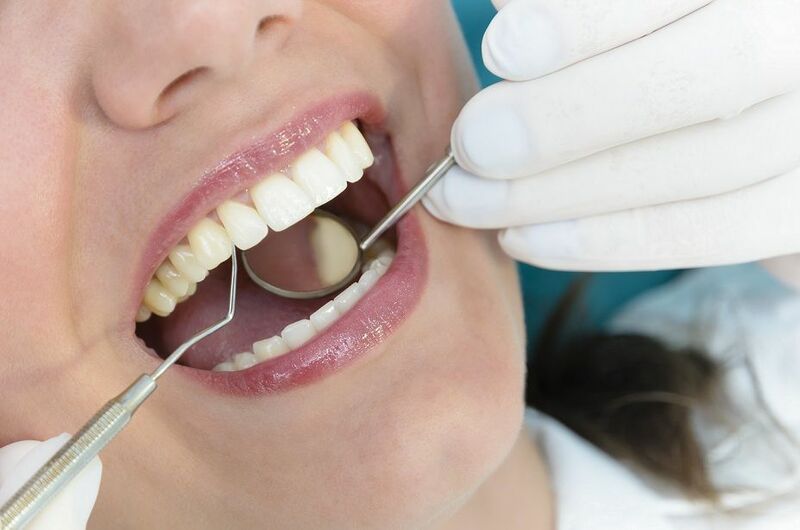 In cases of severe periodontal disease, surgery will be necessary to repair and regenerate the soft and hard tissues and replace any missing teeth. 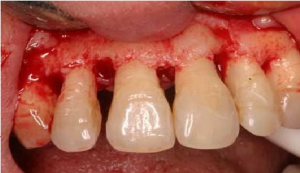 The goal of surgery is to eliminate pockets between the gum and tooth and attempt to encourage reattachment and normal function and esthetics to the patient. Do you feel your teeth look too short and your smile is too gummy or your gums cover too much of some teeth while leaving the others the right length? 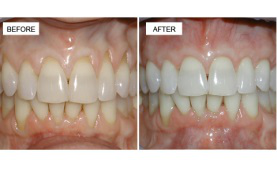 If so, dental crown lengthening might be the solution for you. During this procedure, excess gum tissue is removed to expose more of the crown of the tooth. Then your gum line is sculpted to give your new smile just the right look.